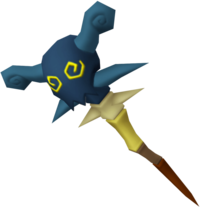 "A staff with great magic and strength. 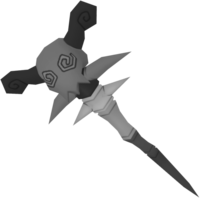 "A staff with great magic and strength. Defense will increase by 3 in critical situations." 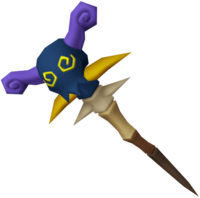 The Shaman's Relic is a staff that can be wielded by Donald Duck in Kingdom Hearts II. In Kingdom Hearts II, the Shaman's Relic has a slightly bent handle that is brown at its base, tan in the middle, and khaki-colored at its tip. The head of the staff's base is a white vertebra, and the head itself is a dark blue skull with yellow, angular spirals for eyes. There is a dark blue vertebra just above the white one, with a light midnight blue spike on either side. It also sports two curled, light midnight blue horns on the sides of its head. In Kingdom Hearts II Final Mix, the Shaman's Relic has a handle that is dark brown at the base, brown in the center, and a tan tip. The first vertebra is off-white, and the two spikes on the second one are now yellow. Its horns are violet. The Shaman's Relic+ has a handle that is light brown at its base, caramel-colored in its center, and pale yellow at its tip. The first vertebra is now silver and the spikes and horns on the skull are orange. The skull itself is predominantly black, though its face is dark red. This page was last edited on 22 March 2019, at 16:14.